Congregation Beth Israel is proud to be a part of the Portland community since our founding in 1858. We are affiliated with the Reform Movement through the Union for Reform Judaism. 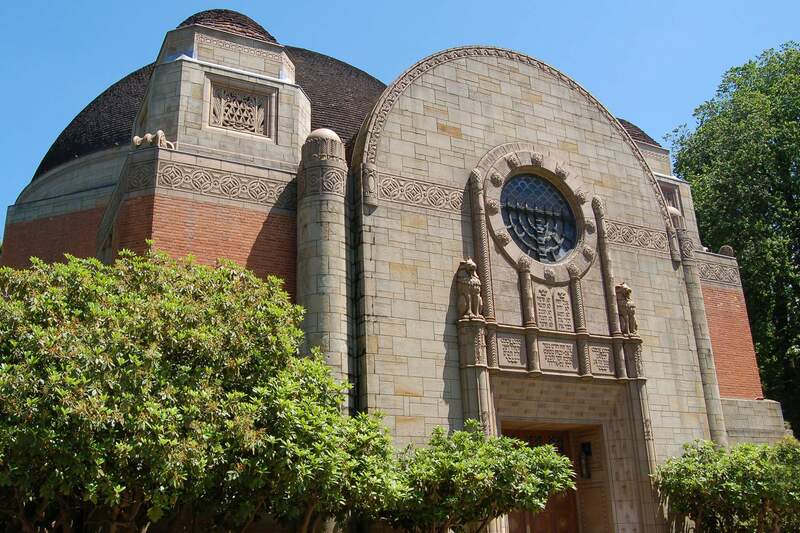 Congregation Beth Israel is the leading voice of Reform Judaism in Oregon. Centrally located in eclectic Northwest Portland, our campus reflects the Congregation’s commitment to Jewish learning, worship and community. Two small chapels provide intimate settings for interactive religious gatherings, while the architecturally renowned Temple (completed in 1928) lends grace and formality to services on High Holy Days, B’nei Mitzvah, Festivals and other occasions. Opposite the historic Temple, the Sherman Education Center houses the Congregation’s URJ accredited Religious School. The center spans 20 classrooms, the cozy Amy R. Goldsmith Library, Shemanski Chapel, Blumauer Auditorium, Miller Room and art room where over 500 students study and worship each year. The lovely WRJ/BIS Judaica Gift Shop is located next to the Education offices in the Sherman Education Center. The Schnitzer Family Center, located just across Flanders Street, was built in 1993 to meet the growing needs of the Congregation. The distinctive red brick structure features the beautifully designed Pollin Chapel, Lipman Foyer, Goodman Reception Hall, Robert P. Weil Administrative Offices and the Shirley & Herbert Semler Board Room. The Congregation also provides a beautifully maintained cemetery with ground burial and four mausoleums for vault entombment and niches for urns. The Landau Chapel at the cemetery is available for funeral services. Beth Israel Cemetery is located in nearby Southwest Portland at 426 SW Taylors Ferry Road. The above video, produced in 2009 in honor of Congregation Beth Israel’s 150th anniversary (1858-2008), takes you on a journey through the past, present and future of the oldest synagogue west of the Rockies and north of California. Congregation Beth Israel was founded in 1858, when Oregon was still part of the Oregon Territory. The new Jewish congregation held religious services in Burke’s Hall, which was located above a livery stable located on First Avenue. The first Synagogue, located on SW Fifth and Oak streets, was built in 1859. Having outgrown the building, the congregation erected its second, larger synagogue in 1889 nearby on SW 12th and Main Streets. In 1923 this Synagogue was destroyed by fire. The present Temple, completed in 1928, is considered one of the finest examples of Byzantine architecture in the Northwest and is designated on the National Register of Historic Places. To meet the growing needs of the Congregation, the Sherman Education Center, opposite the Temple was built in 1948 and then expanded in 1994. Blumauer Auditorium, Miller Room, Shemanski Chapel, our Preschool and Religious School offices, classrooms and Women of Reform Judaism/Beth Israel Sisterhood Judaica Gift Shop. Harris Hall was acquired in 1957 to expand our Religious School. In 1993, the Schnitzer Family Center was dedicated. This newest facility houses the beautifully designed contemporary Pollin Chapel, Lipman Foyer, Goodman Hall, Robert P. Weil Administrative Offices and the Shirley & Herbert Semler Board Room. 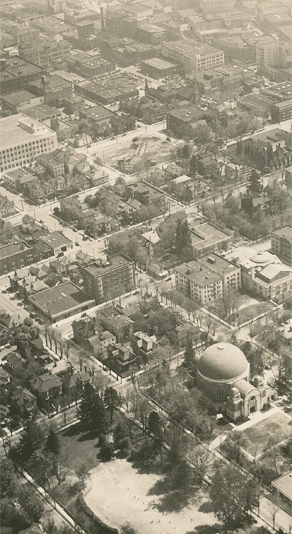 Aerial photograph of Portland’s “Alphabet District” with a newly completed CBI in the lower right. Circa late 1920’s-early 1930’s. Congregation Beth Israel’s history is also an integral part of the history of Portland and Oregon. The names of our founders and past presidents are intertwined among the civic leaders and merchants who formed our city and state. Congregation Beth Israel has had 18 Senior Rabbis in the last 150 years.